The Doom-Cave of the Crystal-Headed Children was LotFP's Free RPG Day 2013 release, and is presented here as a Pay What You Want item. If you want to pay $0.00 for it, no problem. However, without financial pressures of keeping the page count down for the print version, the layout for this PDF edition has been redone from scratch (the print version was 36 pages + cover). Half of all income from PDF sales here go straight to the graphic designer who did this work. The other half goes to the publisher/adventure author to invest in future releases. It wasn’t; but people see what they want to see, and because LotFP wants to work with retailers and be a publisher that produces what retailers want to see, we have decided that per that store's wishes, this year's Free RPG Day adventure should be about the killing of children. Not to worry though—they are freaky crystal-headed children. Inhuman RPG cannon-fodder. ‘Monsters.’ So it’s okay. They deserve it. So you can have fun carving them up. Right? A LotFP Weird Fantasy Role-Playing adventure for characters of any level. As the title indicates, it is a dungeon crawl. 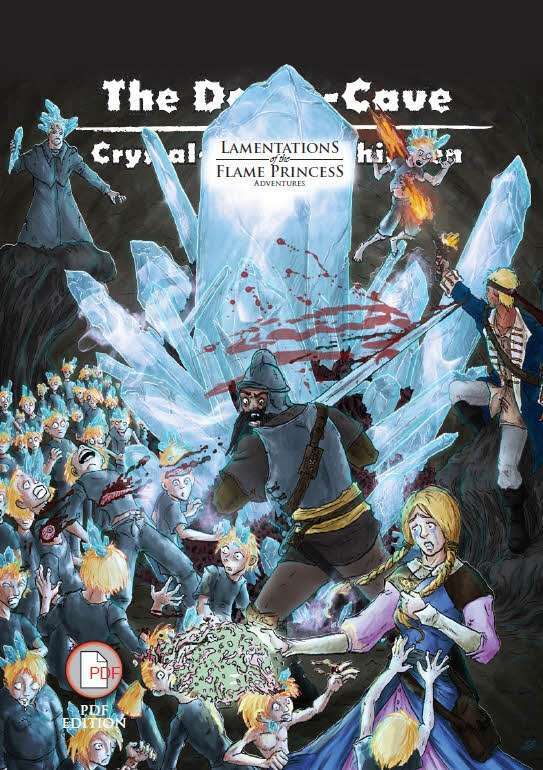 Lamentations of the Flame Princess Weird Fantasy Role-Playing is the horrific adventure RPG out of Finland that holds nothing back. It is part of the Old School Renaissance family of games, which makes this adventure broadly compatible with dozens of other old school games. If you find The Doom-Cave of the Crystal-Headed Children a sufficiently guilty pleasure, look for other LotFP adventures and supplements right here on DriveThruRPG and RPGNow!